The Black Book (Liber Niger) named because of its black velvet binding, is the earliest surviving register of the Order of the Garter. It was commissioned by Henry VIII who took a strong personal interest in the Order. It was begun in 1534 by Robert Aldrydge, Canon of Windsor and Register of the Order but incorporates material from the first known register, the Registrum ordinis Chartaceum, and continues until 1551. Written in Latin, it contains the statutes, an account of the foundation of the Order and details of Garter elections and ceremonies. 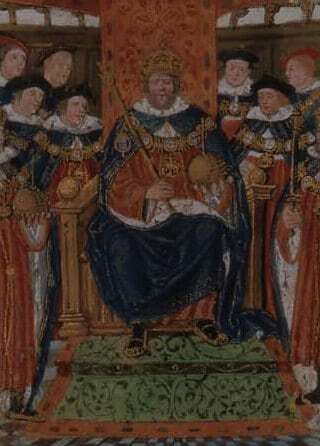 It is richly illuminated, with representations, in decorated initials, of the Founder Edward III and successive sovereigns up to Henry VIII and, as its climax, a central double-page depicting the ceremonies of the Order for the year 1534. These illuminations have been identified as the work of Lucas Hornbolte. Although it is rare for the Black Book to be publicly displayed outside the Chapter Archives and Library, it was one of the outstanding items at the exhibition in Greenwich 1991 to celebrate the quincentenary of the birth of Henry VIII and will form a central part of the display at ‘Henry VIII: A 500th Anniversary Exhibition’ to be held at Windsor Castle for twelve months from April 2009.